I increasing believe that in order to survive and grow in a digital, networked, social, participatory world, media companies need to evolve into marketing services companies. Here’s what’s driving me to that conclusion. HUFFINGTONPOST.COM THIS WEEKEND LAUNCHED A video ad promotion featuring seven TV ads, all selected for their high “viral” potential–meaning some quality that makes them likely candidates for e-mail forwarding. So far the ads, produced by agency JWT, are purely voluntary viewing; visitors have to click on a small video screen on the site’s right-hand side to see them. JWT, formerly J. Walter Thompson, purchased the ad space for this pilot initiative, which will offer TV ads for Ford, JetBlue, Levi’s, the Partnership for a Drug Free America, Scruffs, and Billy Collins–all chosen for humor or novelty value. This is the future — advertising that is worth watching not because you are forced to do so through interruption, but because the marketing message itself is entertaining or useful. And thanks to the fully networked Web 2.0, viral marketing is no longer just a buzzword. Sharing has gone mainstream. So JWT paid The Huffington Post for its “reach,” but as for all of the emails forwarding ads to friends and colleagues, well, that’s FREE, i.e. media DOES NOT GET PAID. Perhaps the Huffington Post is selling that viral reach — if so, more power to them — but that comes at the expense of other paid media. But the truth is that advertisers don’t need media anymore…at least not for traditional ad space…and if they do, it’s only to kick-start a viral marketing effort with an influential site like the Huffington Post, or with a bit of search advertising. And then that’s it — just a bit of paid media, and the social network kicks in. But companies do need marketing services firms like JWT (who did make a major 1.0 mistake by trying to control the email forwarding mechanism and not allowing the embedding of the ads on blogs and other sites like YouTube does, but these kinks will be worked out eventually). When it comes to advertising in mass media, a big name is required since such campaigns are only effective if the viewer already knows who that celebrity is. But in a social network, micro-celebrities who are well known within their network of micro-communities could prove just as effective and potentially even more so, particularly if such campaigns are able to generate buzz, excitement and a cool-factor. As for MySpaceÃ¢â‚¬â„¢s role in all this, they are in the unique position to know better than anyone (as the owner of the platform with all the user data) who the Ã¢â‚¬Å“brand-safeÃ¢â‚¬Â� users are within its network. Thus MySpace can effectively play the role of talent agent by aggregating a list of users who would be appropriate for advertisers within various categories. In fact, the incentive Ã¢â‚¬Å“to be discoveredÃ¢â‚¬Â� is likely to spur many users to express themselves in a manner that will position them favorably for consideration. The result is a win for everyone involved. The Old Navy scenario is already happening. Take a look at the DHL site, waitinwoes.com, where you can upload and animate a photo of your friendÃ¢â‚¬â„¢s face and splice it into the action. Brains on Fire has helped Fiskars to identify some of its customer evangelists and in turn, crafted a Fiskars Brand Ambassador program cutely named, Ã¢â‚¬Å“Fiskateers.Ã¢â‚¬Â� Not only can other Fiskars evangelists become Fiskateers, they can also participate in a Fiskateers blog. 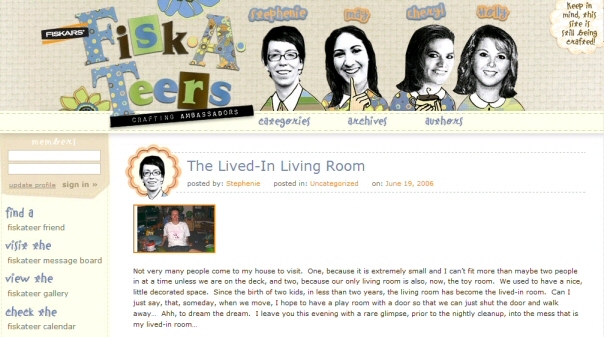 On the just-launched blog, four Fiskateers are actively blogging and sharing their love for all things scrapbooking. While the business of traditional paid media advertising placements is headed into a death spire, there is a very bright future for marketing services. Someone has to help companies create compelling content that will be a destination unto itself. Some has to help companies create value for prospective consumers once they actually land on the company’s site. Somebody has to help companies understand the communities (the group of people formerly known as “the audience”) they want to connect with for viral marketing. Media companies (should) know a lot about how to connect with their audiences, they (should) know a lot about how to create valuable content for their audiences, and they already have channels to reach those audiences — and the best media companies are also learning how to connect their audience with each other and to leverage the power of “communities” — in theory, this should give media companies a huge advantage over traditional marketing services companies. This is the driving force behind lead generation in B2B media, which has made TechTarget a success. Creating white papers and webinars for IT companies is a marketing services function — TechTarget is as much, if not more, a marketing services company as it is a media company. So what does that do to traditional content that media companies create, like news, features, journalism, dramas, sitcoms, etc.? — Those businesses will likely survive, but most won’t grow very much, some will shrink, and some media brands may not survive at all.